The US Science Operator for the Integrated Ocean Drilling Program (IODP) operated the drilling vessel JOIDES Resolution from 2004-2013 for worldwide expeditions numbering between 301 through 346. IODP was an international marine research program that explored Earth's history and structure recorded in seafloor sediments and rocks, and monitors subseafloor environments, building upon the earlier successes of the Deep Sea Drilling Project (DSDP) and Ocean Drilling Program (ODP), which revolutionized our view of Earth history and global processes through ocean basin exploration. IODP expanded the reach of these previous programs by using multiple drilling platforms, including riser, riserless, and mission-specific, to achieve its scientific goals. The IODP was funded by the U.S. National Science Foundation and several countries, only the U.S. component of IODP data is represented in this archive. In 2010, the National Geophysical Data Center (NGDC) began receiving core data processed through the JANUS data system at TAMU for long-term archival, beginning with Expedition 301. In 2013, the first data from the new LIMS data system at TAMU reached the archive, beginning with Expedition 317. In addition to digital core data from the JANUS and LIMS systems, which is available online, core images and other scanned documents and images are also archived. Digital imagery is available on request, but not offered online due to its volume. Text interface enabling search, data download, and links to related data via the Index to Marine and Lacustrine Geological Samples (IMLGS). ArcGIS interactive map interface enabling search, data download, and links to related data via the Index to Marine and Lacustrine Geological Samples (IMLGS). How to cite this data set (doi:10.7289/V58913SM), all access options, and complete documentation. Web page of information about the database including links to data, documentation, and related information on other web sites. Aiello, I.W., Ravelo, A.C., and M.K. Drake (2014): Particle sizes of Pliocene and Pleistocene core sediments from IODP Expedition 323 in the Bering Sea. NOAA National Centers for Environmental Information. doi:10.7289/V5RV0KMN. 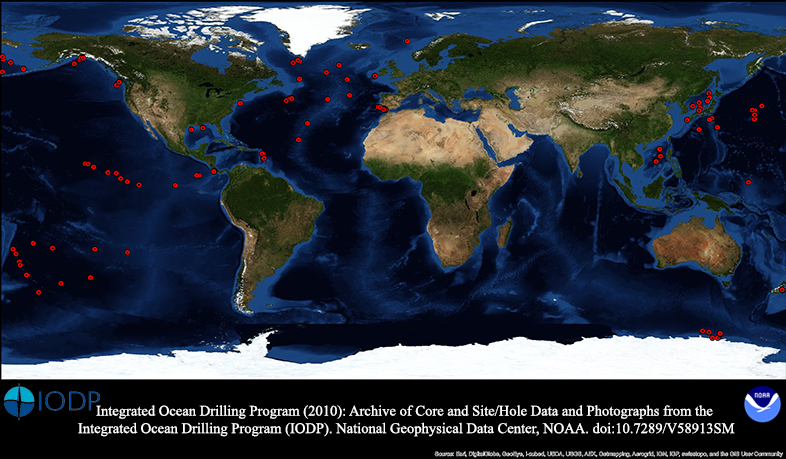 Data Update Frequency Irregular - IODP Expeditions were completed in 2013. Data are still being added to the long-term archive as they come out of moratorium, with the last submission anticipated in 2015. These data were prepared for archive at NGDC by the IODP staff at Texas A and M University (TAMU), to fulfill the requirements of the US National Science Foundation's "Policy for Oceanographic Data", NSF document 11-004. Purpose Marine geological and geophysical research. Research into the deep biosphere and the subseafloor ocean; Environmental change, processes and effects; and Solid earth cycles and geodynamics. U.S. National Science Foundation (NSF). IODP data were compiled by Texas A and M University, Science Operator for the Integrated Ocean Drilling Program, with funding from the U.S. National Science Foundation (NSF). Lineage Statement Data prior to Expedition 317 were exported from the JANUS database system at TAMU. Data for Expedition 317 and higher were processed through the LIMS system at TAMU.